Terry Gilliam's career has always been marked by a delightful sense of absurdity as well as an eye - most likely honed as an animator - for the weird. Sometimes he plays it up big -- Time Bandits, The Adventures of Baron Munchausen, The Fisher King -- and other times... well, actually Gilliam always plays it up big. 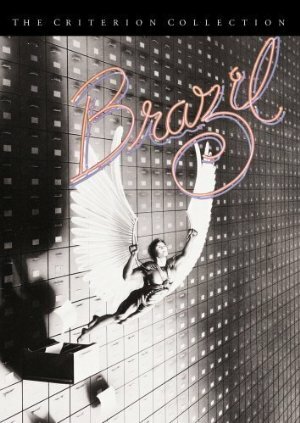 And Brazil is his surrealist manifesto: Art deco swirls in concrete, fetishistic military gear and top hats, it's a pop culture cartoon explosion wrapped over an epic tale of the everyman. Thankfully, Gilliam and co-screenwriters Charles McKeown (Time Bandits) and Tom Stoppard (himself no stranger to weirdness) don't let this Theatre of the Absurd run rampant over the plot - it's surprisingly consistent and emotionally charged. Funny, scary, sublime. And, as many critics have noted, it's frighteningly prophetic. In 1985 audiences scoffed at the idea of terrorists infiltrating the government and waging war on corporate interests. A police state literally "sacking" people and holding them indefinitely in a secret prison where they are tortured? Not possible. A world where technology has overwhelmed us? Where privacy is only a word? You must be kidding. Sure, being a film geek, I can go on and on about Gilliam's battles with the studio for final cut. The infamous "Love Conquers All" happy-ending version of the film is as awful and unnecessary as it sounds, but honestly, nothing can truly dilute the power of Gilliam's revelation. Visionary? Timeless? Indulgent? Call it what you will, Brazil had its fingers firmly on the pulse of world culture and the erratic beat telegraphed The End long before the War on Terror. Easy to say, Brazil isn't so much a movie as it is a movement. Harry Tuttles of the world rise up! The three-disc DVD Criterion Edition of the film is one for the vaults. At its center is a documentary by film critic Jack Mathews which goes into all the painful and gory details Terry Gilliam undertook to get Brazil through a studio system that just didn't understand it. Gilliam wanted his 142 minute version, the studio wanted its 94 minute version. The two films are as different as two from Corman and Disney, with radically different themes, structures, and of course, quality. And you can watch them both, Gilliam's original cut with his own commentary, the so-called "Love Conquers All" version with "Gilliam expert' David Morgan lending an academic tone to the proceedings. Fascinating -- even though you're not likely to watch that third disc once and once only. Criterion has also just released a new single-disc DVD which includes just the "final cut" version of the film and a commentary track, if the big boxed set is too rich for your blood.